As a Manager you will take ownership for multiple internal control, internal audit and risk management projects in the field of Data Privacy. Our clients are under constant pressure from their customers and stakeholders to demonstrate compliance with Privacy/GDPR standards and that's where EY’s Internal Audit, Controls and Compliance department supports them with Advisory services. As a data privacy Manager, you will primarily be leading engagements at our larger (multinational) clients such as the implementation of Privacy Programs including the execution of maturity assessments, creating data mapping flows and the records of processing, and performing Privacy Impact Assessments. Additionally, you will be able to manage and coordinate Privacy risk assessments, the development of internal controls around those Privacy risks, and the continuous monitoring of those controls by means of control testing or internal audit. All to support our clients in creating, implementing and verifying their road map for compliance with GDPR. As a Manager you will take ownership for multiple internal control, internal audit and risk management projects in the field of Data Privacy. Together with a group of highly motivated and skilled professionals, you will be challenged to create innovative solutions and work on building a better working world. You will need to independently lead a team while building strong client relationships. You will be responsible for your team and the delivery of content, providing technically sound solutions for the client. Furthermore you will contribute to the development of our team and commercial expansion to the market. You will need to coordinate with colleagues from the other GDPR-related departments such as our legal practice (HvG), our Cyber Security team, our Fraud Investigations team and our Certify Point practice. You are balancing your time between developing and guiding your team, continuously improving our methodology, consulting with clients, traveling, organizing workshops and supporting business development. If you’re flexible and ready to adapt to a constantly changing environment, there’s no better place to develop your skills. Certified Information Privacy Professional (CIPP). 5+ yrs of relevant work experience in the field of Data Privacy including managerial experience. Goal oriented and stress proof. Excellent understanding of industry standards in privacy (GDPR, ISO 27018). Able to lead data privacy audits/reviews in line with GDPR regulation and to assist clients in implementation of data protection / GDPR programs to address confidentiality and security over customer, employee or patient data. Able to identify and articulate threats and risks to business and technology leaders and understand security and privacy concepts and how they apply to business and technology solutions. Able to act as the main point of contact for your team, management and the client. Excellent project management skills with the ability to collaborate with teams across multiple locations. Excellent problem-solving and proactive mindset with good auditing and interpersonal skills. Willingness to pursue industry certifications e.g. CIPM, CIA, ISO 27001 etc. As a global leader in assurance, tax, transaction and advisory services, we’re using the financial products, expertise and systems we’ve developed to build a better working world. That starts with a culture that believes in giving you the training, opportunities and creative freedom to make things better. Whenever you join, however long you stay, the exceptional EY experience lasts a lifetime. And with a commitment to hiring and developing the most passionate people, we’ll make our ambition to be the best employer by 2020 a reality. 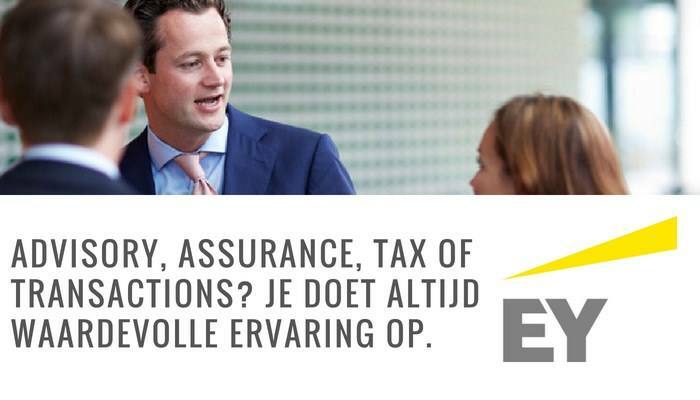 Please send your application for Manager for Data Privacy at EY in Amsterdam including your CV via our website.